Welcome to Shelf Control — an original feature created and hosted by Bookshelf Fantasies. Shelf Control is a weekly celebration of the unread books on our shelves. Pick a book you own but haven’t read, write a post about it (suggestions: include what it’s about, why you want to read it, and when you got it), and link up! Fore more info on what Shelf Control is all about, check out my introductory post, here. Want to join in? Shelf Control posts go up every Wednesday. See the guidelines at the bottom of the post, and jump on board! In the mountains of Northern China ancient custom demands that every man have a wife to keep him company in the afterlife. Deshi Li’s brother is dead—and unmarried. Which means that Deshi must find him an eligible body before the week is up. Lily Chen, sweet as a snakebite, needs money and a fast ride out of town. Haunted by the gods of their ancestors and the expectations of the new world, Deshi and Lily embark on a journey with two very different destinations in mind. 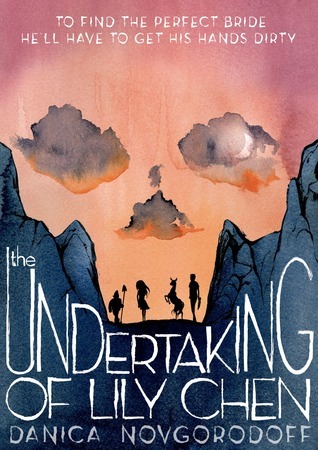 They travel through a land where the ground is hard and the graves are shallow, where marriage can be murder and where Lily Chen is wanted—dead and alive. In 2014, after reading a review soon after the book was released. It sounds great, doesn’t it? I love the idea of the ghost bride, as well as the combination of old traditions and new society. I’m always on the lookout for unusual graphic novels, and this one sounds like something really different. Write a blog post about a book that you own that you haven’t read yet. Add your link in the comments! And if you’d be so kind, I’d appreciate a link back from your own post. Great! And I’m really, really going to make a point of reading it… soon. Now you’ve got me interested in wanting to read this book! It sounds really good. Let us know when you’ve finished it, what you think. Thanks for letting me be apart of Shelf Control. Thanks for sharing your link! I read this back in 2015 and just went and looked up my notes on it to confirm my recollection of it. I recall really looking forward to reading it after reading a great review of it on the Reading Rants blog. I wrote, “meh, so-so” Not sure if I had overly high unrealistic expectations or if my head just wasn’t in the right place at the time for the book. The drawings were great though. I’ll be interested to learn what you think of it when you ge around to reading it!